Video of flights over top monuments of Moscow in HD format. The cultural capital of Russia - Moscow – never ceases to attract travelers by dozens of iconic architectural and cultural landmarks. Saint Basil Cathedral, Novodevichy Convent, Ostankino Tower, and Ivan the Great Bell Tower is, by far, not the complete collection of objects of interest. 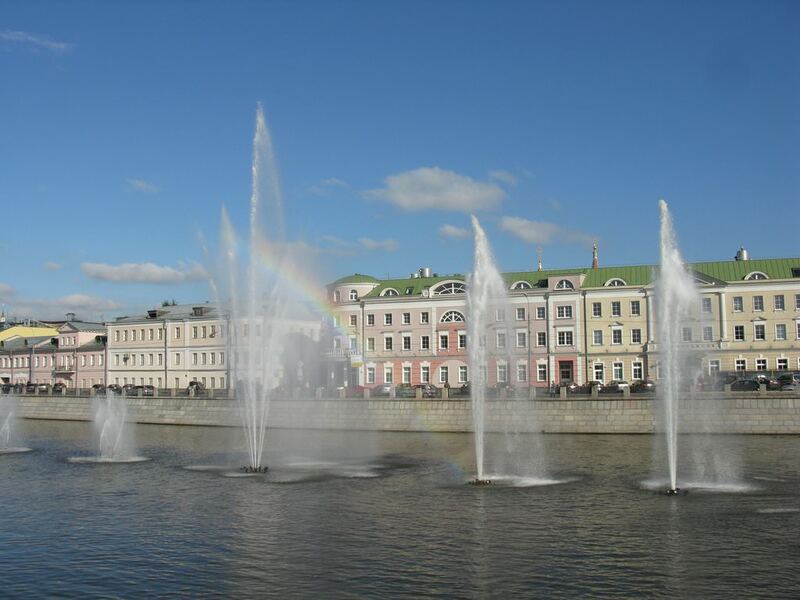 In this review, we will try to include descriptions of the most important architectural landmarks of Moscow. We accompany them with interesting facts, colorful photographs, and 3D virtual tours. These 3D tours allow you observing the landmarks from a bird’s eye view. Simply turn on the HD video and enjoy the flight! » The St. 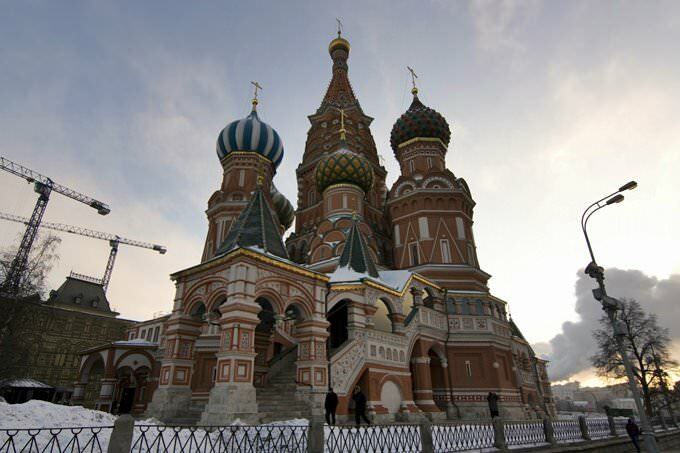 Basil Cathedral is situated on the Red Square in Moscow. It’s widely known as the monument of Russian architecture. » The St. Basil Cathedral is one of the most famous sights of Russia. 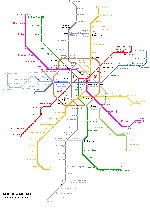 For many it’s the symbol of Moscow. 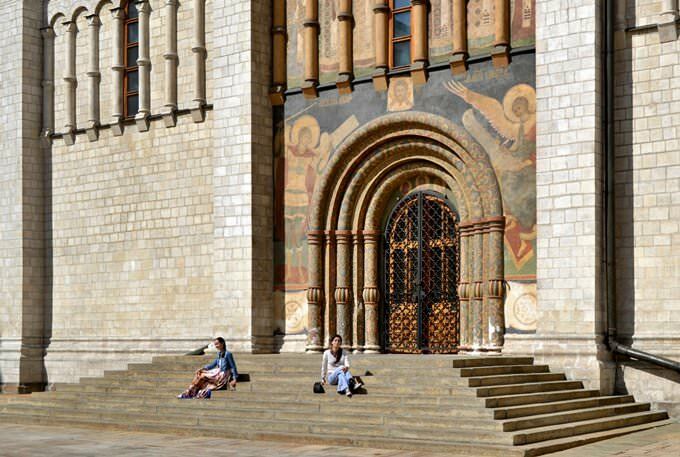 » Currently the Cathedral is a branch of the State Historical Museum and is included in the List of World Heritage Sites in Russia. » The Cathedral has been repeatedly restored. Asymmetric extension, tents over porches, intricate decorative domes (they were gold originally), decorative painting on the outside and inside were added in the 17th century. » The modern bell tower was built on the site of the ancient belfry that has decayed and fallen into disrepair in the second half of the 12th century. In the 1680s it was replaced by the bell tower, which stands to this day. 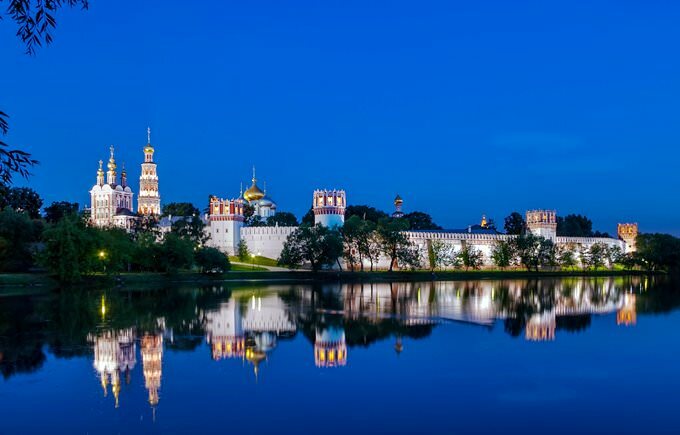 » The Novodevichy Convent is the Russian Orthodox convent church in Moscow. 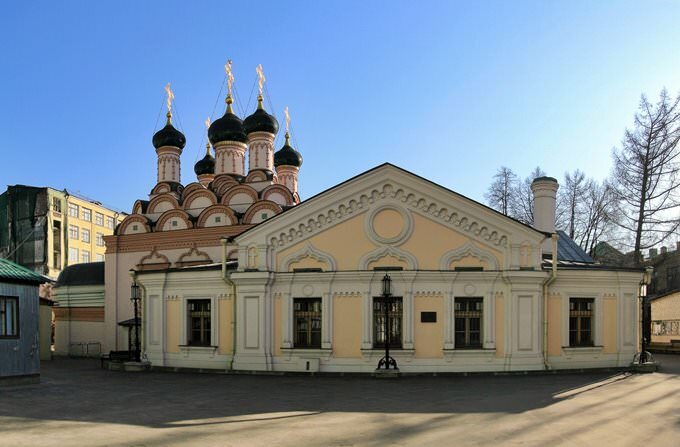 » The monastery was founded in about 1524 in the suburbs of Moscow on the Maiden’s Field. » The Cathedral church of the monastery was built on the model of the Assumption Cathedral of the Kremlin; the former is one of the most significant monuments of ancient art in Moscow. » Walls and tower of the monastery were built in 16- 17th centuries; most of the currently existing buildings of the monastery date back to the 2nd half of the 17th century and represent a fine example of Moscow Baroque. » Representatives of royal and princely families, including Grand Princess Sophia, were buried in the building. At the monastery there are graves of the poet Denis Davydov, writers Michael Zagoskin, Ivan Lazhechnikov, Anton Chekhov, historian Sergey Solovyov, General Aleksei Brusilov and others. » Ostankino is the TV and radio broadcasting tower. » The tower is 540 m, thus it occupies 8th place in the world by height. » The project was created by architect Nikitin overnight; the inverted lily became the prototype of the tower. » Ostankino TV tower has two viewing platforms, indoor and outdoor, of 337 m and 340 m, respectively. The outdoor observation deck is open only in warmer months, from May to October. » For 30 years the TV Tower observation deck and restaurant Seventh Heaven have being visited by over 10 million visitors. » Ivan the Great Bell Tower is the church bell tower situated on Cathedral Square in Kremlin. » Ivan the Great Bell Tower is an example of the influence of the Italian tradition on freestanding bell towers construction. » After increasing the height to 81 m in 1600, the bell tower was the tallest building in Moscow before the beginning of the 18th century. » In the old days royal decrees were read aloud from the belfry. » In total there are 34 bells on the tower. » The Saint Sophia Church in the Middle Sadovniki is the Orthodox church on Baltchug Island opposite the Kremlin. » The church is an architectural monument of federal significance. » Wall paintings created at the turn of 19-20th centuries by artist Count Komarowski have preserved inside. 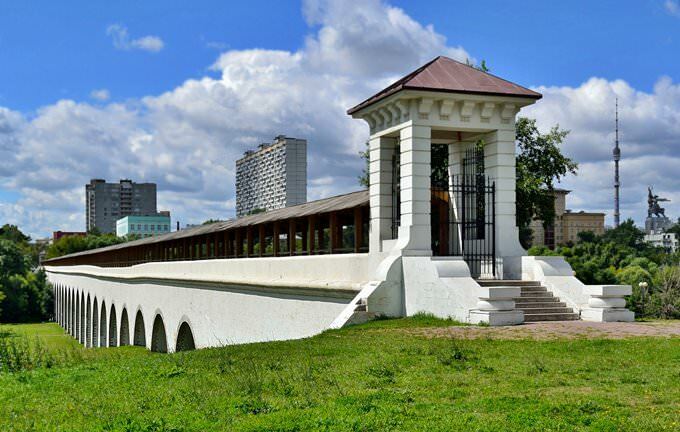 » The free-standing three-tier belfry was built in 1862 - 1868 by the architect Nikolay Kozlovsky. 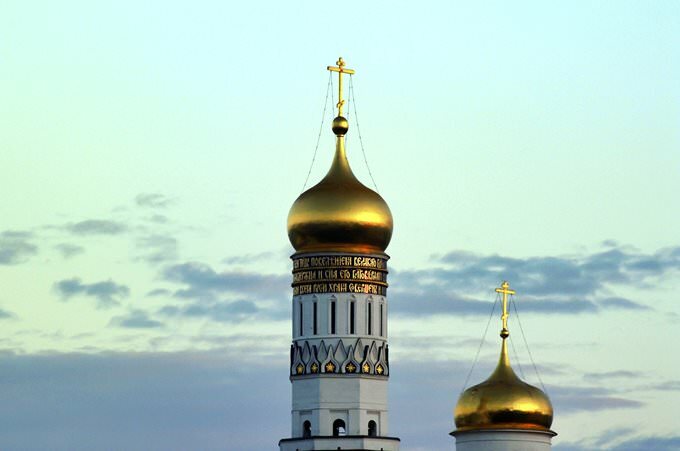 Its distinctive silhouette in the Russian-Byzantine style isn’t associated with the architecture of the temple itself, but corresponds to the verticals of the Kremlin towers located opposite. » The church didn’t act in 1930s, as the premises were used for housing and laboratory. » Currently, the temple is fully restored and elements of 17th century are reconstructed. » The Dormition Cathedral is the oldest completely preserved building in Moscow located on the Cathedral Square of the Moscow Kremlin. » The Dormition Cathedral was built in 1475 - 1479 under the guidance of Italian architect Aristotle Fioravanti and was the main temple of the Russian state. » Currently the Dormition Cathedral houses the museum. However, it conducts service on some days with the blessing of the Patriarch. » The Dormition Cathedral keeps the Nail and the staff of St. Peter, Metropolitan of Kiev and All Russia. » The cathedral has long been the burial place of most of the Moscow saints. Facts: » The Gregory Thaumaturgus Church is the architectural monument of the 17th century. » The temple hosts regular liturgy, all the sacraments and rites. » The sisterhood of the Icon of the Mother of God and Orthodox school act at the Church. » The baptistery for adults, the church fabrics shop, stalls with Orthodox literature and utensils work in the temple. » Male choir sings at ministers. » The temple has many shrines, such as relics of the Holy Fathers of the Kiev Caves and other saints. This guide to architectural sightseeing in Moscow is protected by the copyright law. You can re-publish this content with mandatory attribution: direct and active hyperlink to www.orangesmile.com.